If you have a suitable owl nest box, whether bought or handmade, there's still no guarantee an owl will come and nest in it. There are certain things you can do to attract an owl to a nest, but you'll also have to be patient as it may be some time before one moves in. Fix the nest a minimum of 10 to 15 feet off the ground. A tree is the best place to attach the nest to, but you could also fix it to the side of a building or to a tall post. Just make sure you locate it somewhere relatively quiet, where an owl isn't likely to be disturbed. Before an owl has time to pack his bags and move into the nest you've placed, you might find that other critters have tried to make it their home. Common intruders include starlings, squirrels and opossums. There's nothing you can do to discourage them from moving in, but if you notice any signs that someone else is living there, remove all nesting materials to put them off returning. Although it might be tempting to try to attract multiple owls onto your property, they won't want to live there if it's overcrowded. A large suburban plot of one or more acres can support two owls; don't place more than two nests or there won't be enough food to go around. A smaller urban or suburban property should have no more than one nest. If you have a larger, more rural property, you should be able to place three nests per five to 20 acres, depending on the quality of the land and how much suitable prey it holds. Place your nests on different trees, at least 10 feet from each other. 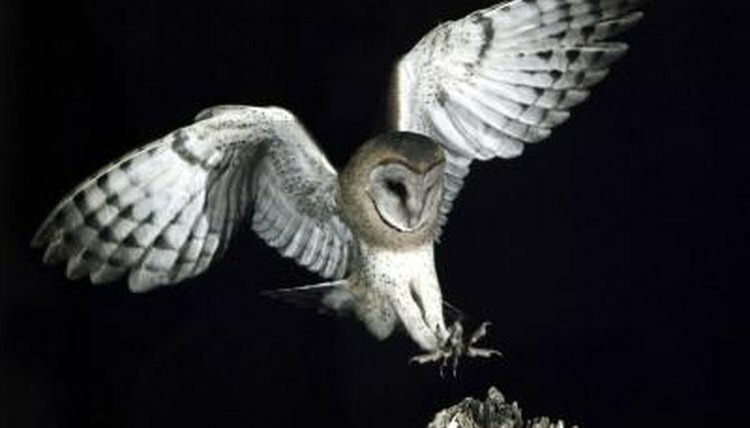 Owls like to live in areas where there are plenty of small mammals, such as mice and voles, for them to prey on and where there are plenty of places to perch. To attract small mammals to your property, plant hedgerows and thickets -- or maintain and protect any that you have currently -- and leave some large areas of long grass. A property with plenty of trees, including dead and dying ones, will be more likely to attract owls to use your nest box.